Two species of Petroselinum, the native Corn Parlsey (P. segetum) and the introduced Garden Parsley (P. crispum), are recorded in Britain. Two British miners are recorded on Petroselinum. A key to the European miners recorded on Petroselinum is provided in Bladmineerders van Europa. 1b > Leaf-miner: Linear mine. 2a > Leaf-miner: A large blotch, yellow or brown, preceded by a short corridor that in the end mostly is completely overrun. 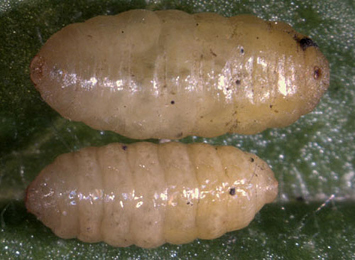 Generally several larvae share a mine. Especially in fresh mines the green primary and secondary feeding lines are well visible. Pupation outside the mine. Polyphagous. On numerous genera of Apiaceae and possibly some Asteraceae, including Petroselinum, in Britain and elsewhere. Throughout the British Isles. Also recorded in the Republic of Ireland and most of the Palaearctic region, as far east as Afghanistan. 3a > Leaf-miner: A short, irregular, linear upper surface mine on any part of the leaf. Also recorded from young pods (Bland, 1997a). Polyphagous. On 119 plant genera in 31 plant families of which only 4 plant genera in 2 plant families, but not yet on Petroselinum, in Britain. Local, probably introduced to Britain. Widespread in continental Europe particularly in Botanical Gardens and glasshouses. Also recorded in Egypt.